This is a marriage of Mediterranean flavours, combining Greek feta with marinated Italian anchovies. Rub the garlic around the inside of a salad bowl. 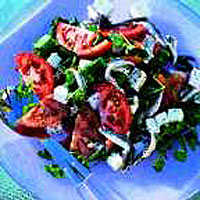 Line the bowl with the leaves, add the tomatoes and anchovies, and scatter the cheese over the top. Season and drizzle the salad with the reserved oil from the cheese, then toss together just before serving.